Even if it isn’t served in a hand-painted cherry blossom trifle dish, this gorgeously delicious mousse will wow any dinner guests. Creamy, rich in flavor and not-too-sweet it’s perfect for a spring brunch table. 1. Bloom Gelatin: In a small bowl, sprinkle the gelatin over the water and let stand until softened, about 5 minutes. 2. Make the Raspberry/Cherry Puree: In a blender, add 10 cups of the raspberries with 1 cup sugar. Puree until smooth. Using a fine sieve, strain the puree into a bowl to remove the seeds (don’t worry some seeds will get through and that’s okay). In a microwave oven, melt the gelatin for 10 seconds on low power. Whisk the gelatin and cherry extract into the raspberry puree. Stir in pink food coloring if desired to enhance the color. 3. Whip Egg Whites: In a large pyrex bowl set over a pot of simmering water, whisk the egg whites with the remaining 1/2 cup sugar until warm to the touch. Remove the bowl from the heat. Using a hand-held electric mixer, beat the whites at medium-high speed until stiff and glossy. Fold the egg whites into the raspberry cherry puree. 4. Whip Cream: In a standing mixer fitted with a whip attachment or using a hand mixer, add the heavy cream and beat until creamy. 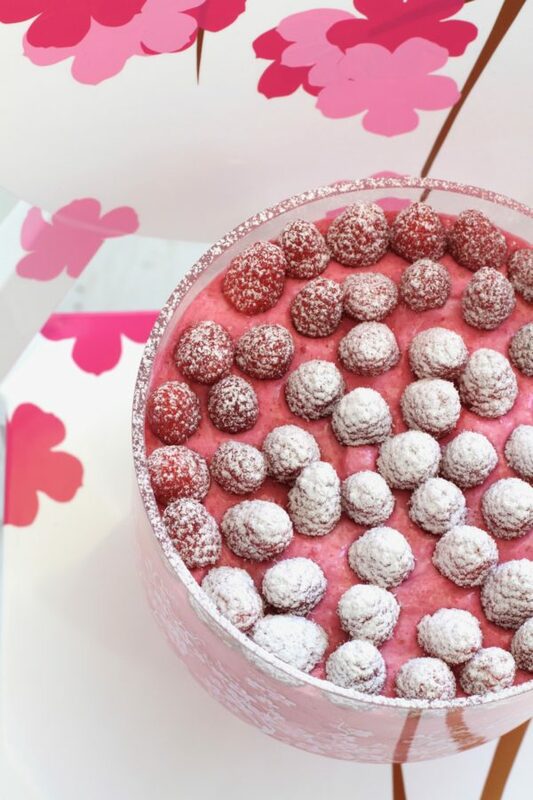 Add pink food coloring if desired to keep the dessert super pink. Continue to beat until firm. 5. Finish Mousse: Fold the whipped cream into the raspberry cherry mixture. Pour into a trifle dish or individual dishes and refrigerate overnight. To Serve: Top with remaining fresh raspberries and dust with powdered sugar. 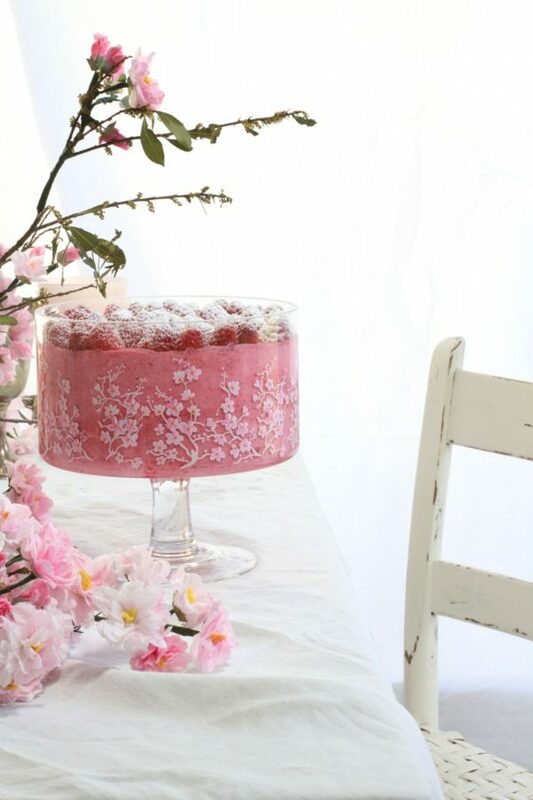 Watch this beautiful Cherry Blossom-inspired Dessert Course come together!